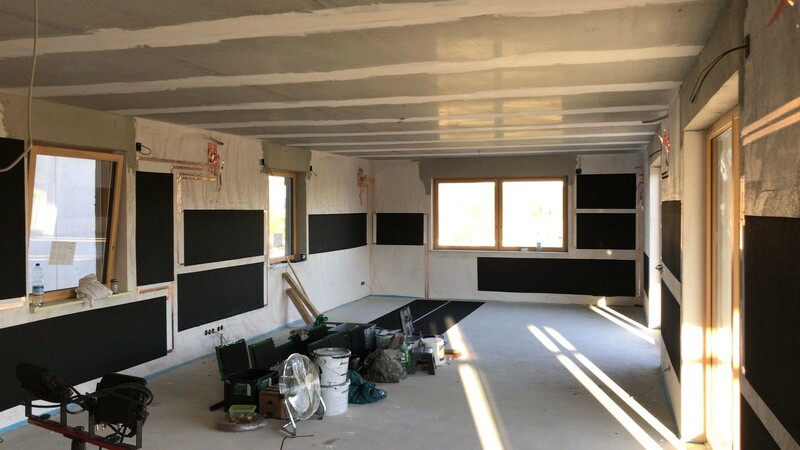 G2Temps 24 Volt Low Carbon Wall, Ceiling & Flooring Infrared Heating For The Home & Business from G2Techk & The Gallery. G2Temps is our energy saving low carbon, 24-volt powered building infrared heating paint & storage system. It is the latest state of art heating technology. It holds and conducts heat efficiently and cost effectively. 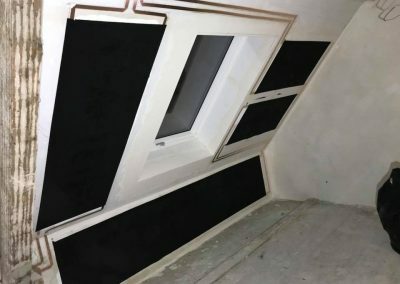 It is the perfect solution for every heating situation, building modernisation, refurbishment and new developments of homes, businesses and buildings. 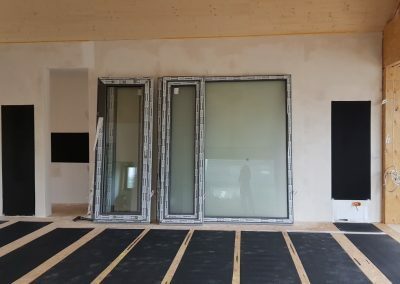 It is also ideal for passive house projects. 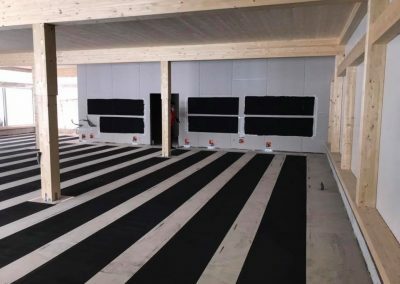 Using infrared heat, the system in effect turn walls, ceilings & floors into safe heat store radiators. 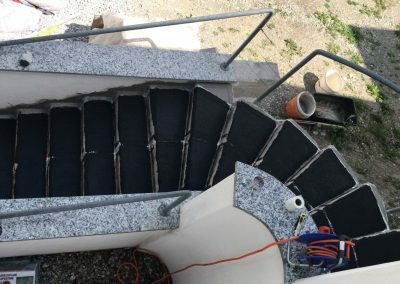 It can also be used for roads, external drive ways, walk ways and steps. 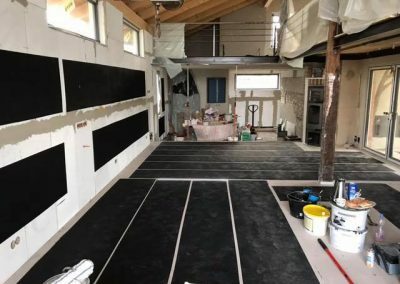 G2Temps Wall, & Floor Installation. Thermal Image Proof Of Working G2Temps Heating System. 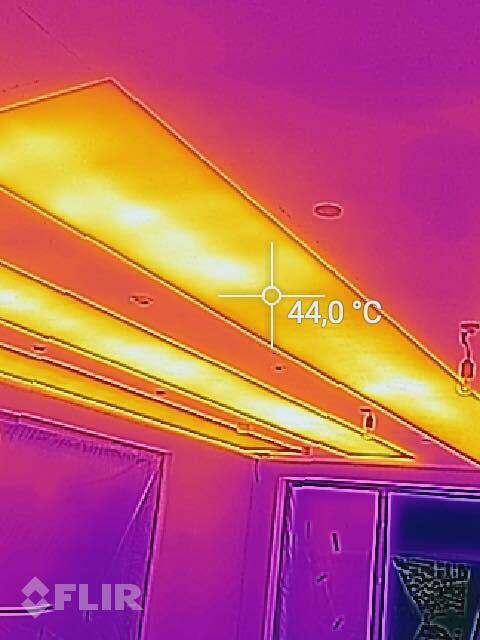 Ceiling Thermal Heat Test Proof. 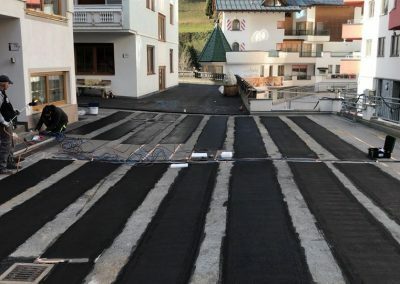 Outdoor Anti Frost Heating With G2Temps System. 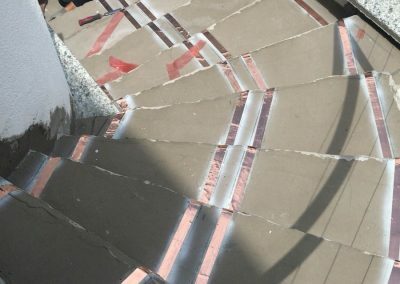 Outside Stairs G2Temps Copper Tracking Preparation For Anti-Frost Heating. 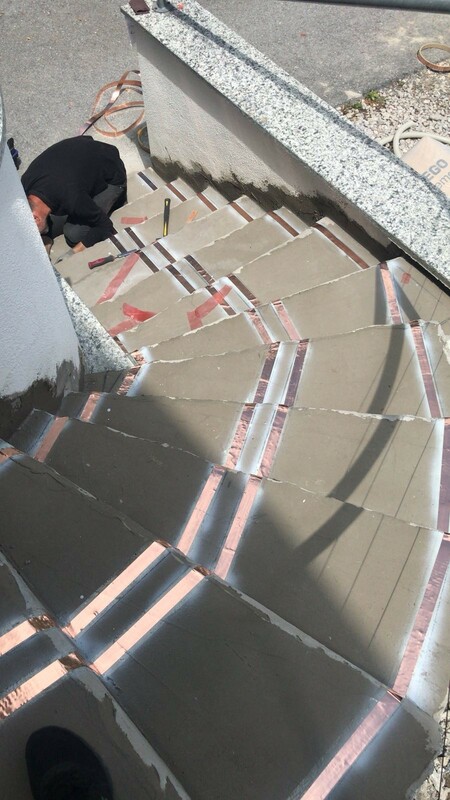 Outside Stairs G2Temps Paint Over Copper Tracking Preperation For Anti-Frost Heating. Thermal Image Proof Of Working G2Temps Anti Frost System On Outside Stairs. 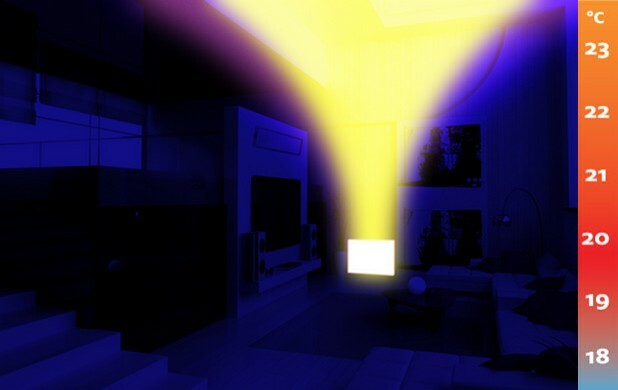 Hundreds of happy & satisfied customers have already been installed with this infrared technology. Our engineers, physicists and test consumers got together to create the perfect heating system. Many years were spent experimenting with the carbon paint technology to get the right viscosity. i.e. 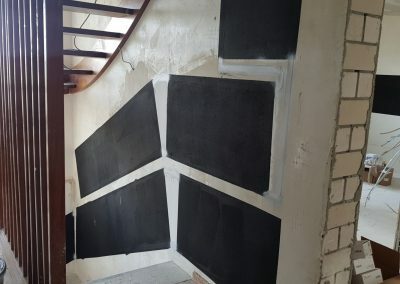 This was to ensure the now patented paint coating was of the right mixture to be able to hold and radiate the infrared heat after application over our electric copper tracking system. We created an incredibly efficient and economical heating solution. The paint combines low consumption, with superior durability but still is amazingly handy and easy to use. The paint heats up fast & therefore saves energy in doing so. 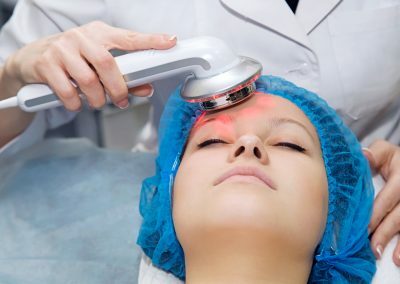 It was developed to ensure that infrared heat is held & directed at the right rate of frequency to efficiently and economically heat the human body. 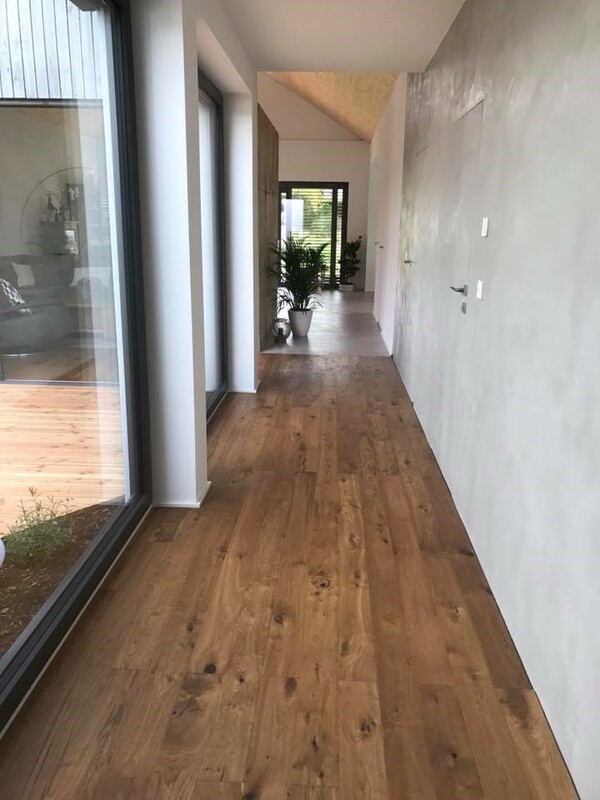 As our system covers most of the wall floor and ceiling area that is needed heating, then with more surface area, the heat distribution is more balanced. 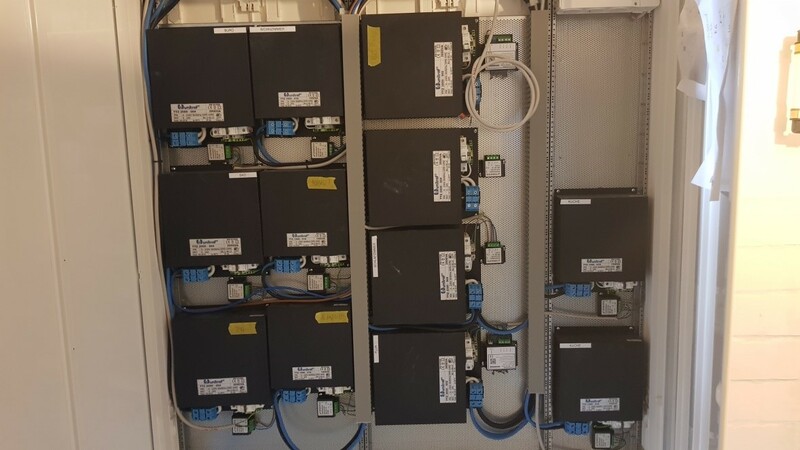 This all means that we only need consistent 24 volts to do the same heating operation that would normally take 240 volts of supply. Hence you are saving a massive amount of energy using G2Temps.Solar energy power can also be routed to help power the heating system. The science behind infrared is simple. It is the process of projecting safe electromagnetic wave photons through the air ( not heating the air itself) into the body or an object causing their molecules to accelerate creating heat. Corridor With Flooring & Wall Finish On Top Of G2Temps Heating System. The Technology & Energy Saving Benefits. Chestnuts in an earthen, stone or unglazed pot will bake softer than when in an iron pot. Therefore, this soft baking is an effect of the far infrared rays produced when ceramics, stone or the like is heated. 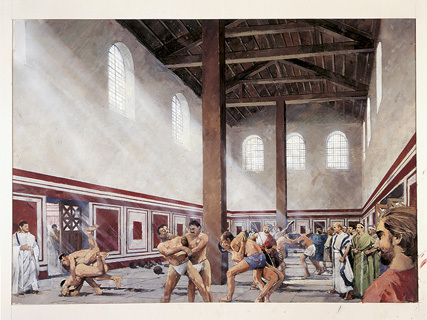 Ancient Romans understood infrared by developing their training halls & buildings with windows at an angle to capture the sun’ s rays to direct heat in. Infrared works by directly heating the objects, furniture, structural fabrics and the human body. That heat will be retained in all and slowly released into the room. This means that once the fabric has heated up and begins to release the heat into the room, your heating can switch off. The carbon paint material will continue to emit heat out for some time whilst switched off, thus saving electricity. In effect, the room takes much longer to lose heat too. 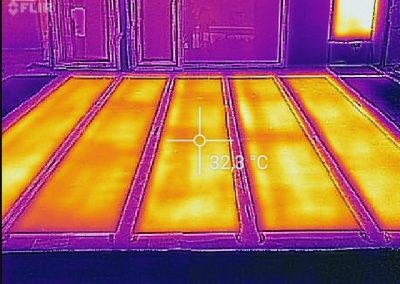 The direct heating nature of infrared means that you can heat for less time per m3 than you do with standard electric and or gas convection heating. It is just like when you walk outside on a clear winters sunny day. You immediately feel warm by the suns infrared heat even though the temperature might be as low as zero degrees around you. No matter how big the outside open space is, but when the suns rays hit you, you do not feel the cold. This is due to the body’s natural ability to directly absorb infrared heat. Our infrared heating system mimics this process. There is no need to waste energy heating the air when you can heat directly a person. Our system heats at between 30 degrees C & 60 degrees C which is the temperature required by the human body and the same as it radiates out. Far Infrared rays are part of sunlight that we can see in visible rays from the sun. They are also in the form of invisible rays that oscillate at a wavelength of 6 to 14 microns on the safe part of the light spectrum. This is demonstrated by the red bands to the right in the light spectrum image below. Far Infrared played an important role for the formation and growth of living things. This is also the reason why far infrared rays are also known as “biogenetic rays”. All living things on Earth are mainly composed of water and proteins. Water molecules are always oscillating and at 8-10 micron wavelength, the “resonance” occurs. This causes the activation of water into hydrogen ion and hydroxide at high speeds (10-12 seconds). If this occurs in human cellular tissues, the metabolism of cell and excretion of residues from cells or nutrition are enhanced. This promotes growth in living things. 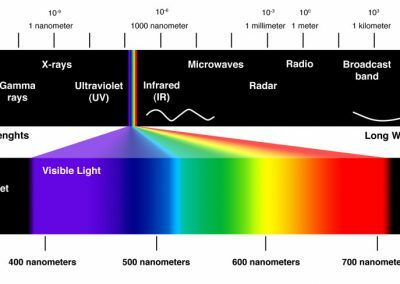 Because infrared rays from the sun emit in the IR safe light spectrum at 3.5 to 10 microns of wavelength then you will understand why at 6 to 14 microns an infra red heating system will have great benefit to the human body. Humans, animals, flora and nature in general itself has life due to the benefit of safe infrared heating energy from the sun. Human beings emit far infrared rays. Many scientific papers have been published that highlight the benefits of far infrared heat. Operating In the safe light spectrum, only FIR transfers energy purely in the form of heat. This is perceived by thermoreceptors in human skin as radiant heat. FIR’s effect on tissues promotes healthy circulation of blood and body fluids. The effect of this, is to enhance the distribution of oxygen and nutrition to every part of the body. 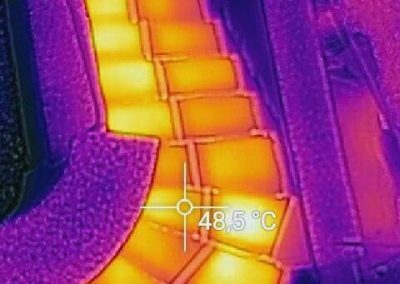 Hospitals and the equine industry have used infrared for years and to tremendous Bio genetic effect to aid healing and circulation. FIR has been reported in medical trials to heal chronic back pain and claims to be effective in reducing cellulite. 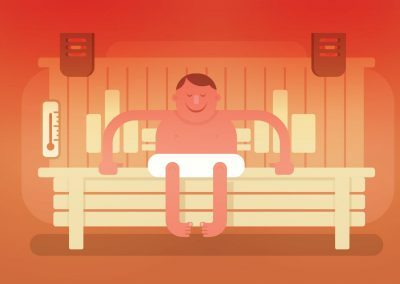 We have developed our G2Temps Heating paint to ensure heat is held & directed at the right rate of frequency to efficiently and economically heat the human body. The use of bedding made from ‘Bio Ceramics’ technology is also much better for us. This is because it provides you with better and sound sleep, and faster recovery from fatigue. 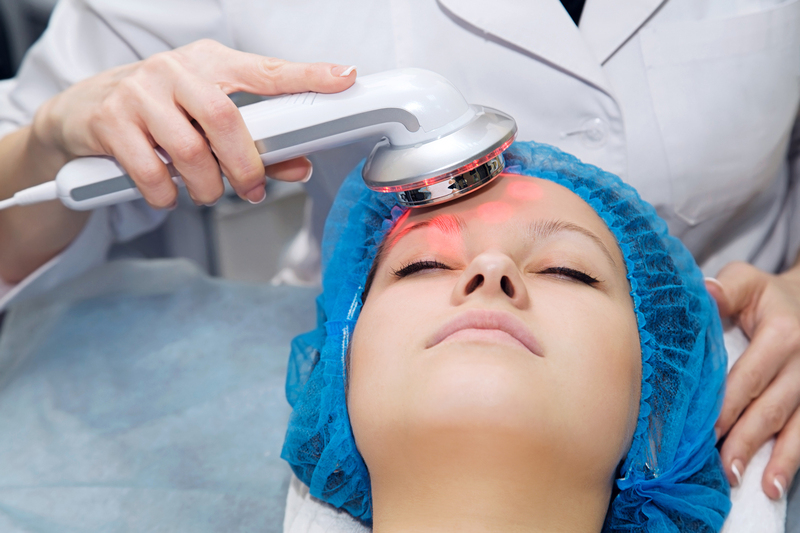 Infrared LED Therapy For Skin Repair. Infrared Light Therapy For Back Pain. 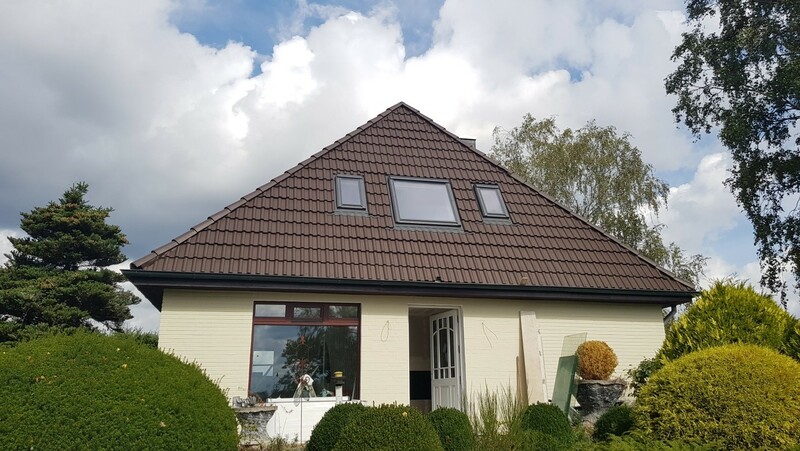 An infrared heating system is perfect when you need some fresh air and open a window, as the energy and heat won’t get lost because it heats you by direct waves not by heating the air. Infrared is the perfect weapon against mould and rising humidity. The process of ‘capillary action’ is combatted with our infrared heat paint & G2Temps system. The humidity inside the walls will not only evaporate, but also be prevented from creeping in again by counter pressure. 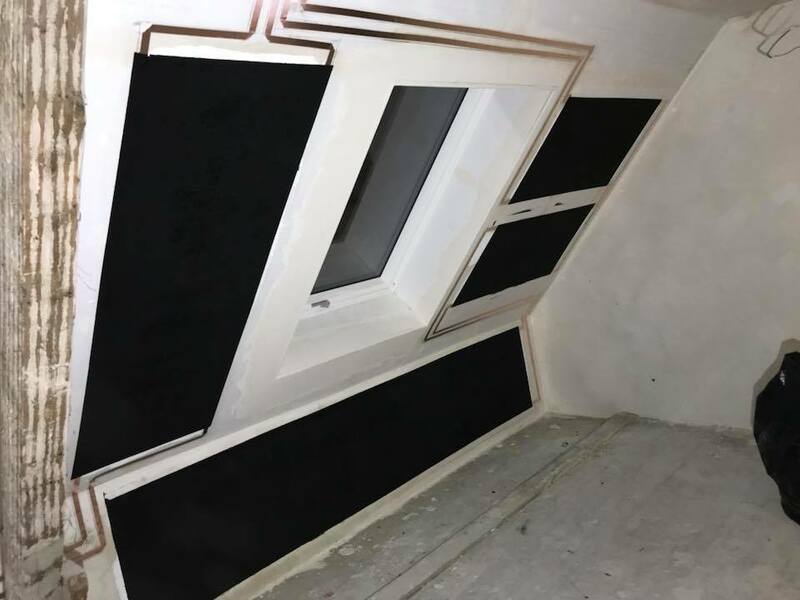 Damp prevention and the process of not heating the space means that keeping the air quality fresher through infrared heat is ideal for asthma sufferers. 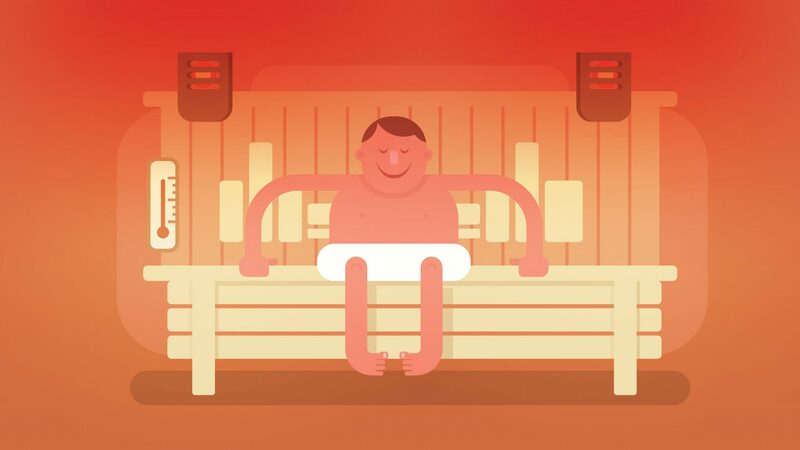 Studies on the effects of infrared heat on air quality have shown to be very beneficial to the human body. It is reported that we need around 600 litres of oxygen a day. 25% of the air consists of oxygen. This means we need 2.4 m3 of fresh air per day. A normal room has approximately 120m3 of air content. Warm air heated by convection is considered as stale and less oxygenated. The air outside feels fresher & more fragrant but equally is perceived as colder. These two points are helped by our infrared heating system. Spa’s use infrared saunas as treatment for their clients due to the technologies ability to aid body healing and its other benefits. 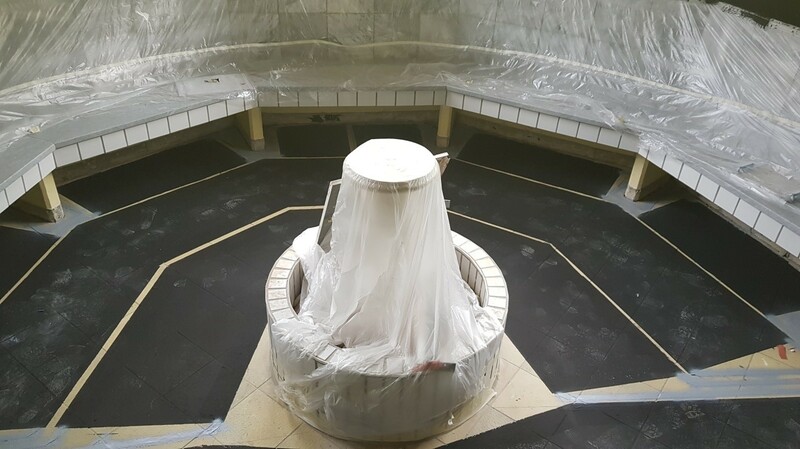 Below are examples of some of our spa installations. Spa G2Temps Infrared Heating Project. 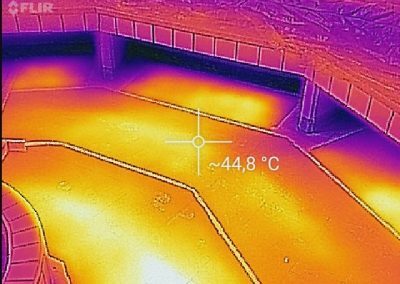 Thermal Image Proof Of Working G2Temps System in Spa. 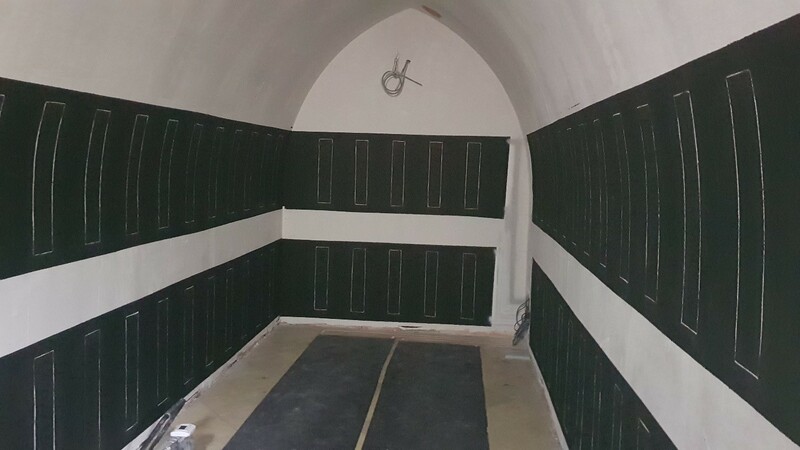 Spa Room G2Temps Infrared Sauna Installation. 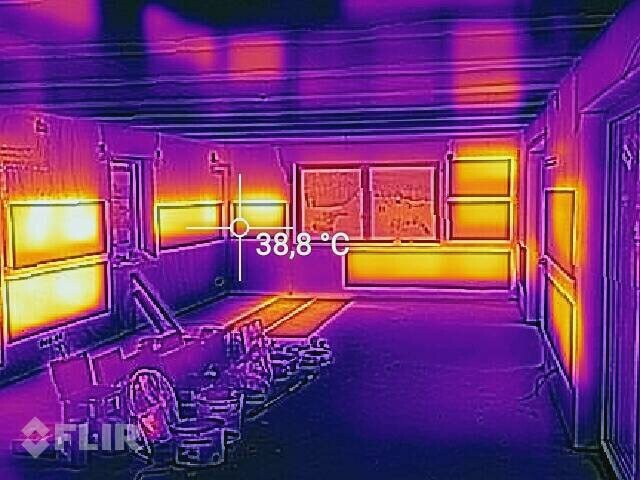 Thermal Temperature Image Proof Of G2Temps In Sauna. UK Government’s Promotion Of New Technologies To Meet Carbon & Energy Reduction Targets. We need to act now to protect our planet and enhance the future sustainability of nature. Forecasts indicate that within 12 years, standard convection heating could be phased out to more efficient and healthier heating systems. The heating market is developing solutions to comply with those government targets. The Gallery & G2Techk are committed to that revolution. We have been testing, working & installing the latest state of art heating systems for some time. Radiators and heating panels on thermostats that turn off to save heat at the right temperature can also loose heat by conduction into the walls behind them & out of the building. Our G2Temps system mounted onto insulated walls & insulated plasterboards avoids this problem. 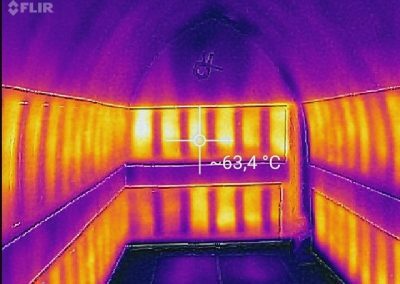 Studies have also shown that in highly insulated properties the cost of infrared heating can be close to gas costs or even lower for a number of reasons. We explain this principle here. 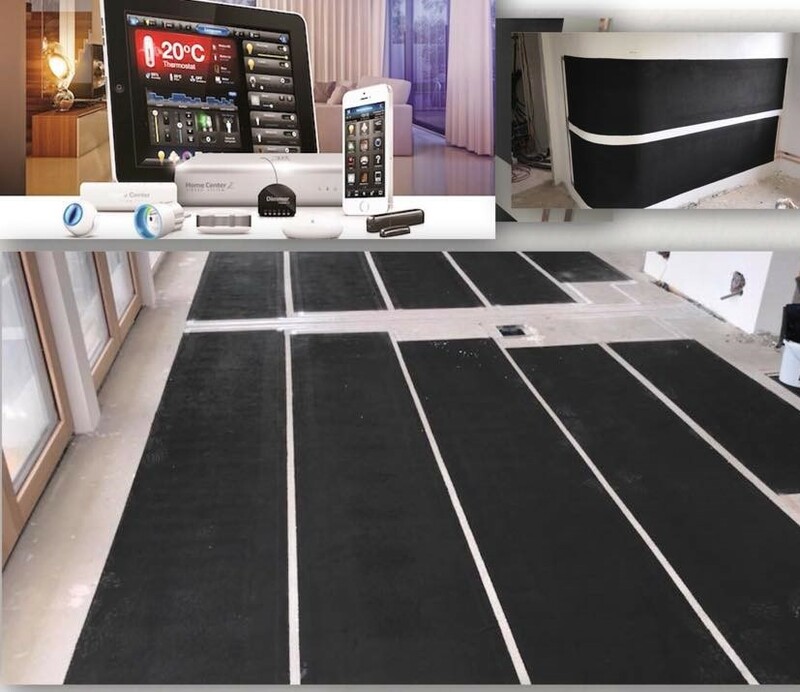 A running boiler or electrical convection heater will have to compensate to continue to heat the room and temperature differences can be as much as 5 to 7 degrees between the floor and the ceiling. Training on the basic law of thermodynamics often does not cover that this law is affected by diathermancy ( the property of transmitting heat by electromagnetic waves). This is the process of heating the fabric structure, the furniture and the people in the room directly rather than via the air (convection). 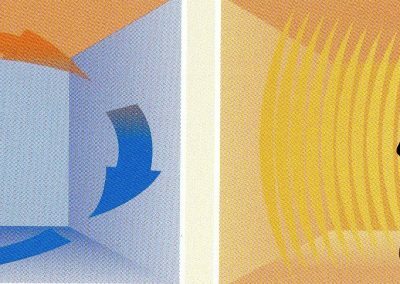 Heating of air by convection also leads to air and heat escaping through door gaps, windows & open doors. 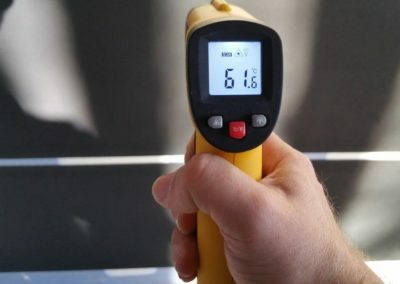 Using Infrared heat means there is very little heat loss and air movement. With no air movement the difference in heat temperature between floor and the ceiling of a room can be as little as 1 to 2 degrees only. 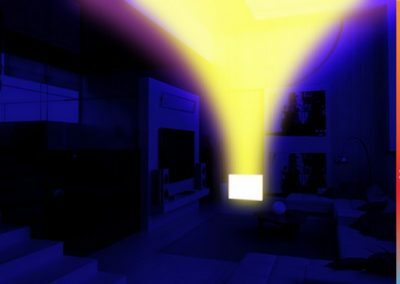 The radiant power of infrared is described by the Stefan Boltzmann law, that it is proportional to the fourth power of the absolute temperature. In contrast, a convection heater needs “over temperature”, thus there is a temperature difference between radiator and air, in order to operate. After many years of development we have created a perfect consistency in our carbon paint coating to ensure it heats up fast. The speed of it reaching temperature quickly reduces the amount of time using electricity and thus saves on energy costs. 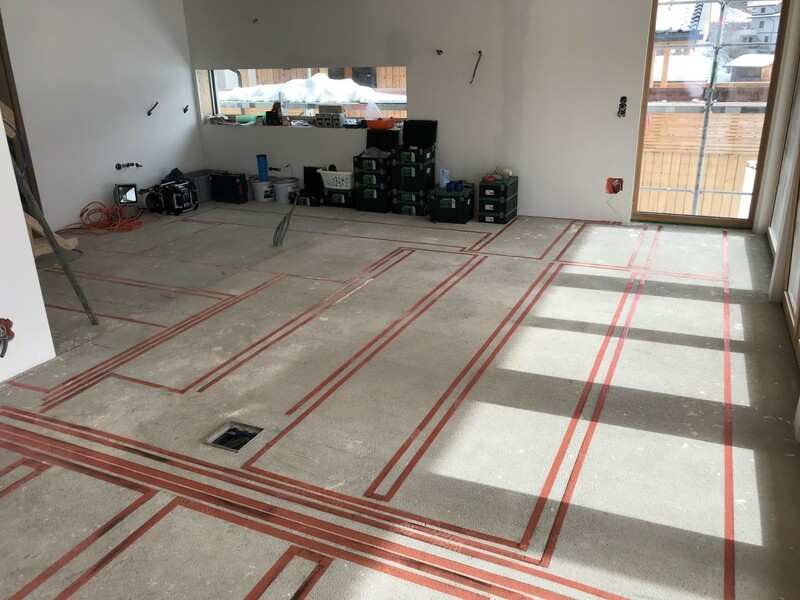 As our system covers the majority of the wall floor and ceiling area needed heating, then the heat distribution is more balanced. 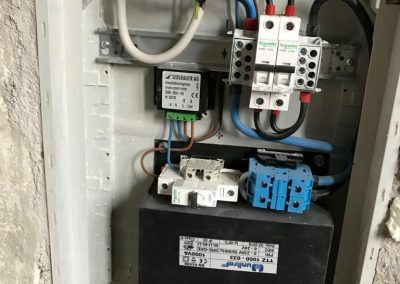 This again means that we only need 24 volts to do the same heating operation that a normal electrical heating system would require 240 volt supply. This reflects a massive saving on energy costs. G2Temps is much more efficient than any other electrical heating system. 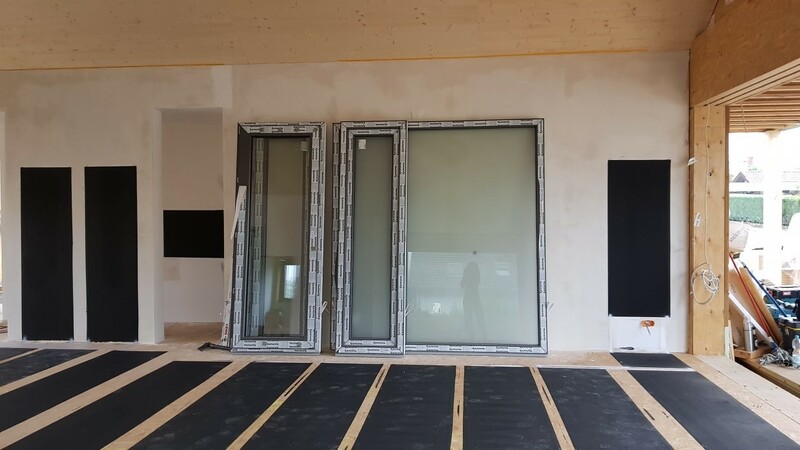 One of the reasons is that differences in temperature between the heating system and the outside walls are very small and therefore nearly no heat at all escapes outside. 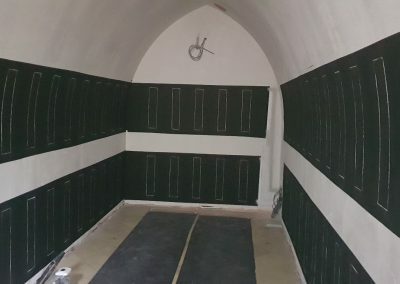 As the walls start to dry out from the operating heating paint, the walls become more effective insulation. 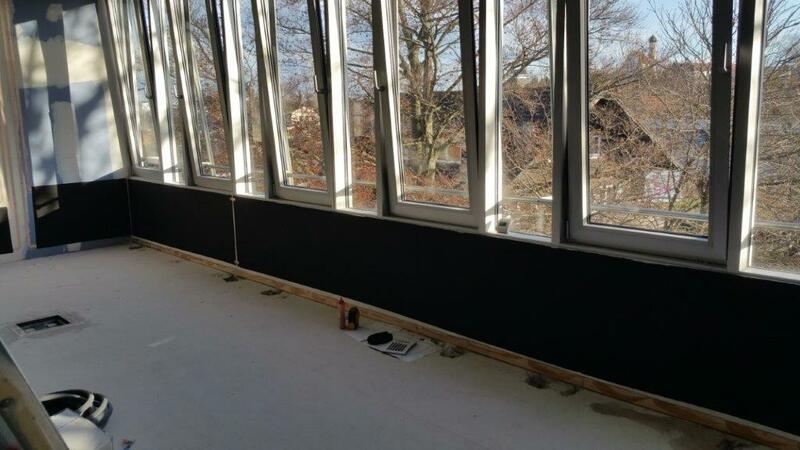 The heat paint becomes a heat storage system whilst also radiating enough heat to keep the occupants warm. 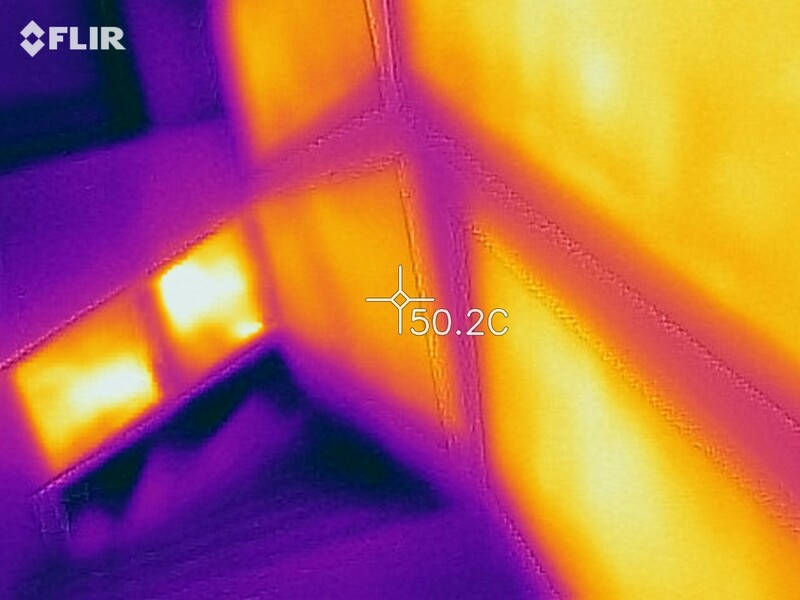 G2Temps Heating Installation On Stair Wall. 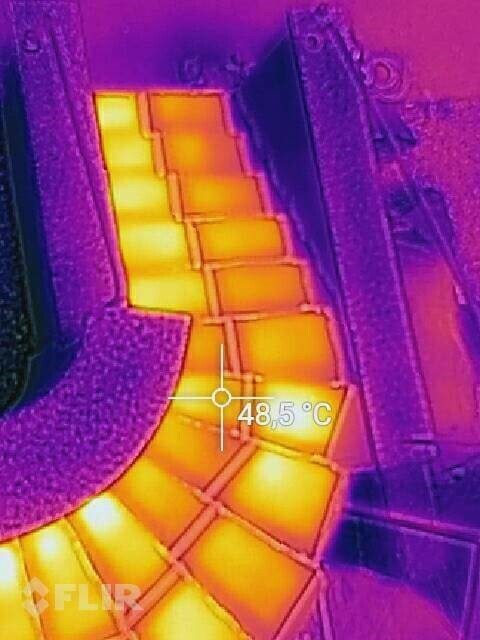 Thermal Image Proof Of G2Temps Working Stairs Wall Heating. Although the price of gas seems lower than electricity, it is wise to consider the additional costs involved in running convection electric and gas heating systems. Because traditional convection heats the air (See image below) and cold air is heavy than warm air then a standard boiler has to constantly run to compensate for heating the space due to the air movement. Add to that breakdown and replacement and maintenance costs of boilers over time then the real cost of gas can be considered comparable to that of electricity running costs. In addition, the continued effects on the environment from burning fossil fuels means gas and electrical heating is unreliable. Infrared heating systems in a fully insulated buildings do not need to operate at full power nor do they need to run constantly. 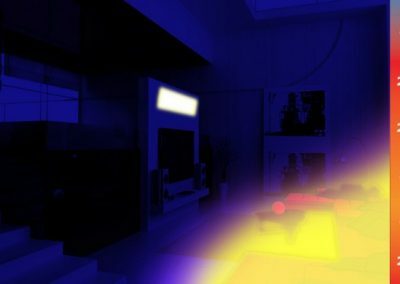 Renewable energy such as wind and solar can be utilised to help power infrared. Infrared heaters have no moving parts, there are no servicing costs once you have installed. 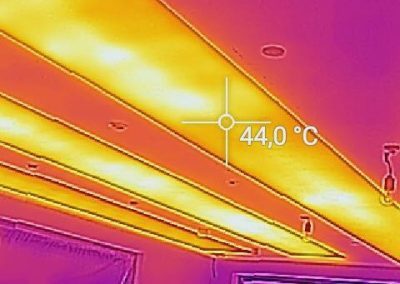 This is the reason why more and more new builds and refits choose infrared heating technologies. Old forms of electrical heating such as electric radiators is frowned upon because of their expensive running costs. 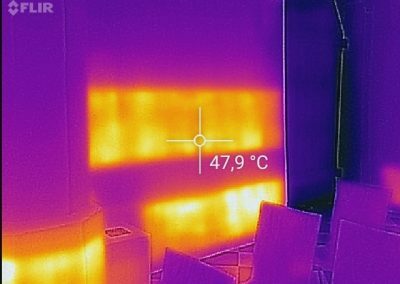 High powered infra red heating panels require 240 volts to operate similar to other forms of electrical heating. 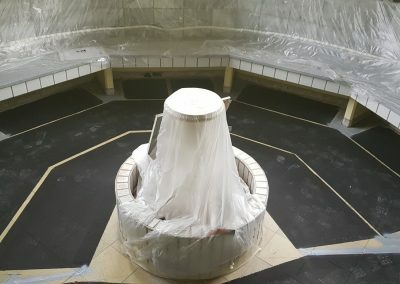 This is because they only cover a small area so they require the higher electrical current to reach 80-100 degrees C to direct that heat out & to hold them at that operating temperature to keep you heated. Thermal Image Proof Of Residential Heating Project. Installed transformers ensure G2Temps gets all the power it needs. 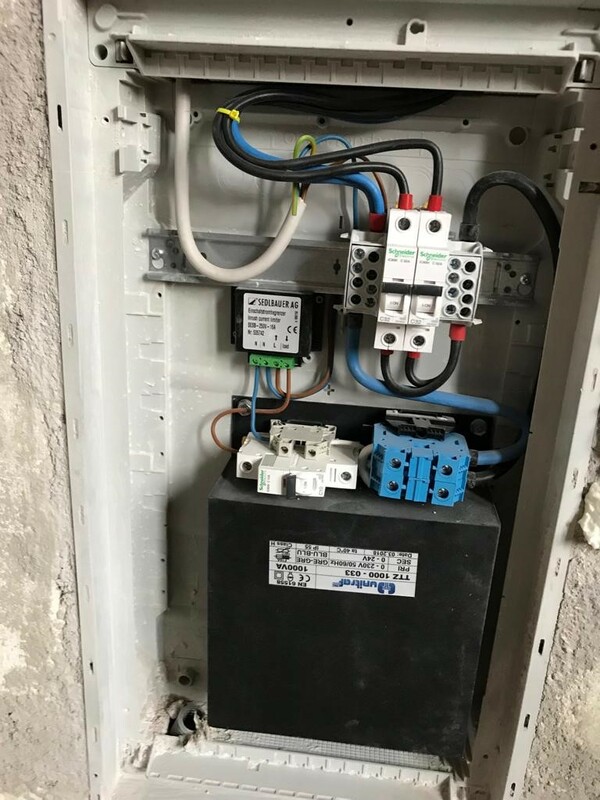 It runs on very low 24-volt voltage transformers ( See images below) which makes it possible for the system still to work should a nail be driven through the paint or when new sockets are fitted through it– the heat paint will continue to do its work. 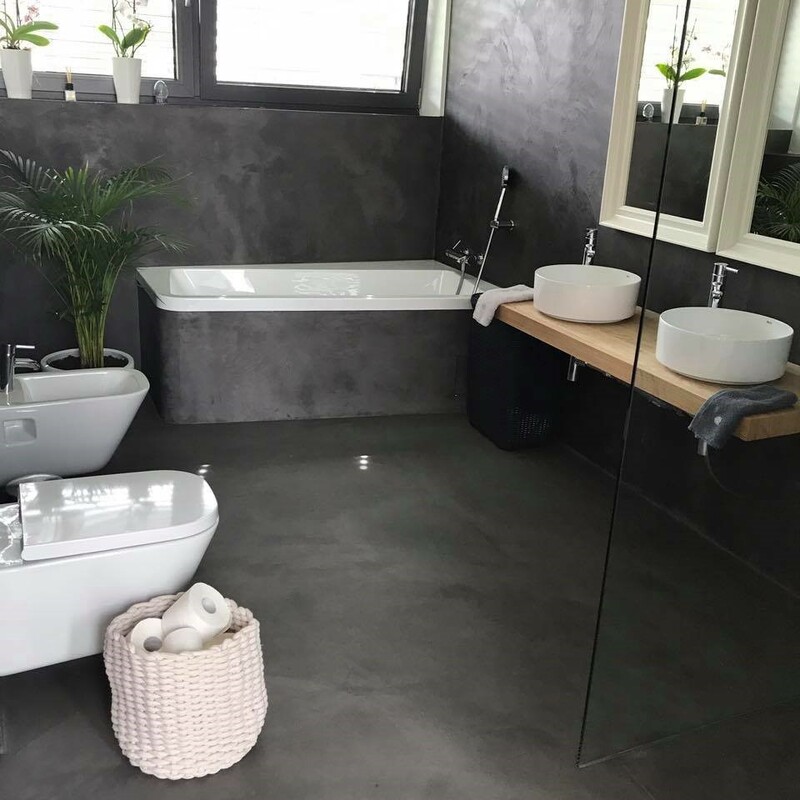 G2Temps was also developed because it could be applied to walls, floors & ceilings without the need for space taking radiators or heaters. 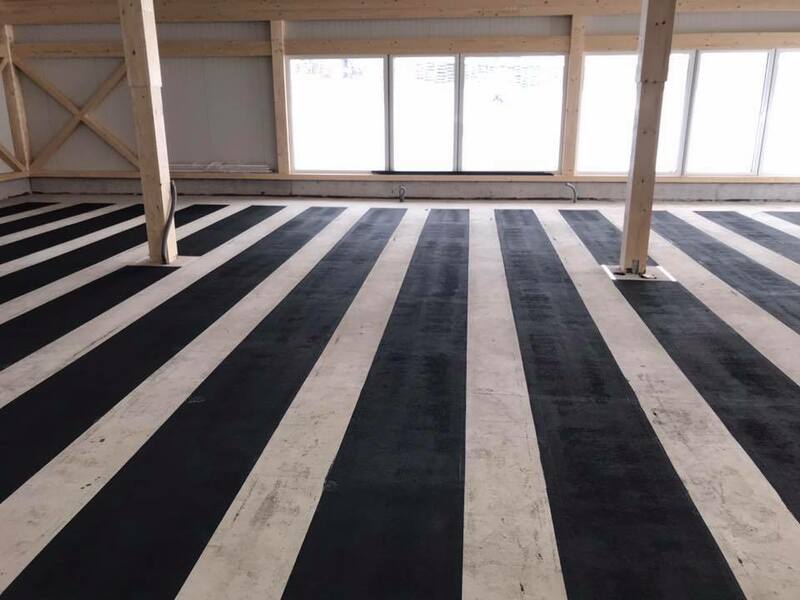 It is simple to install into a new building development by simply laying out our copper tracks and covering the wall, and or ceiling and floors then covering with our revolutionary heat carbon paint. 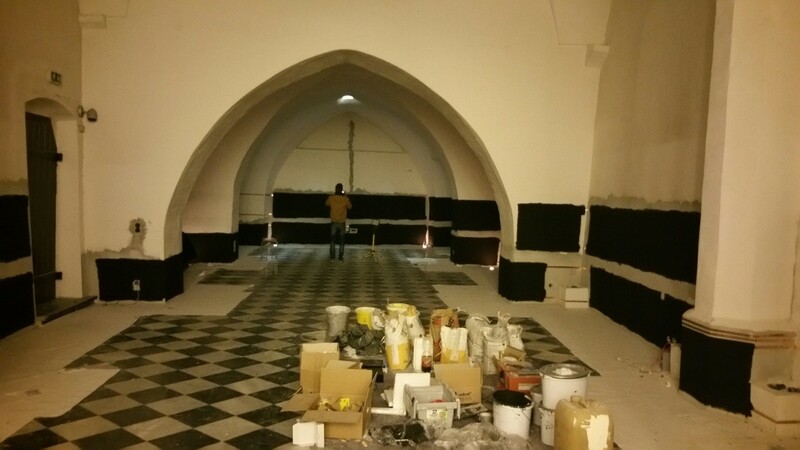 Finish with plaster & paint- and it’s done. With our knowhow it is as simple as it is genius. Using an electronic thermostatic device with your infrared heating also allows you zonal heating control. 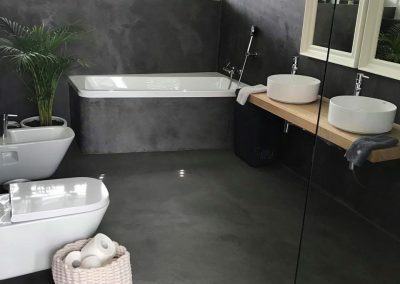 The benefit of that is that you can switch off heaters in other rooms yourself or ideally remotely by thermostatic control, whilst you are in another room with the heating on. This again means you that you are also using less energy. Infrared heating can switch off when the control system reads that enough heat has been held in the fabrics, wall, floor, ceiling, objects and people and therefore gives savings on running costs. G2Temps Installation Of Copper Tracking. 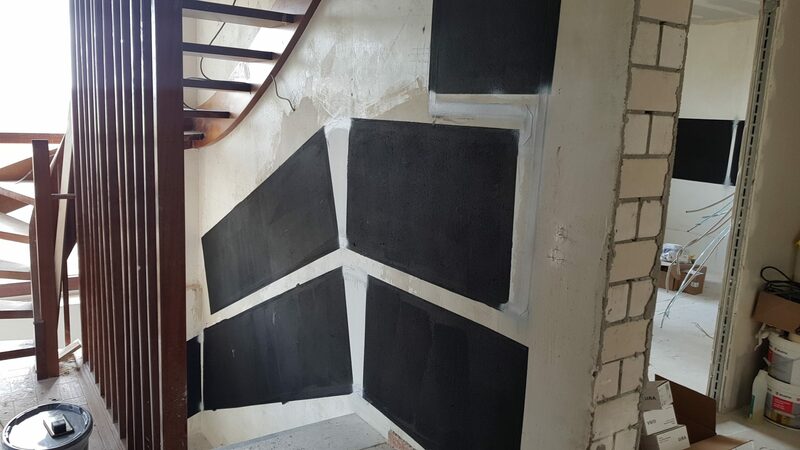 Installation After Copper Tracking Is Painted With Our Carbon G2Temps System. System Transformer for 24-Volt Power. Control System For G2Temps Heating System. 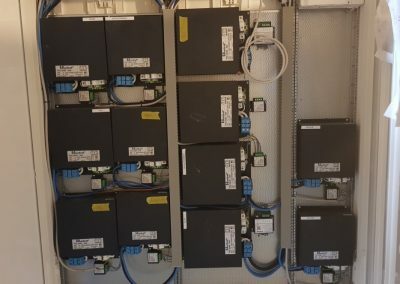 Multi 24V Transformer Design & Install. 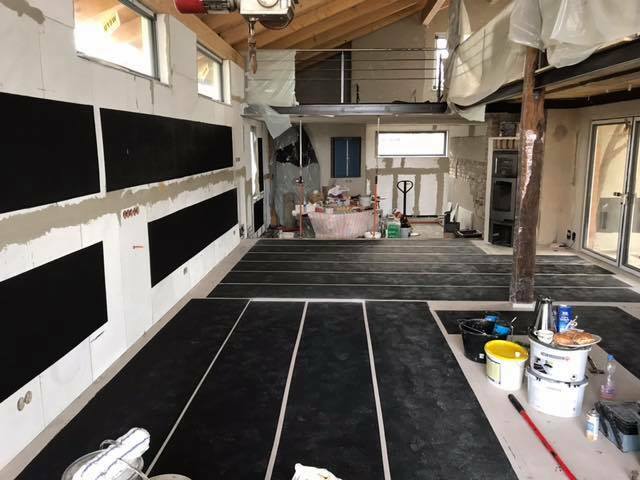 To solve heat conductivity issues, we recommend applying a special insulation plaster on walls and floors before installing G2Temps. 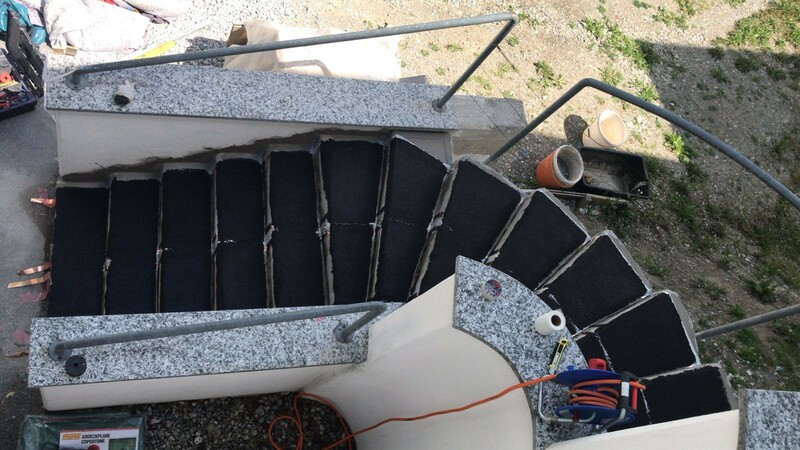 This combination has proven especially useful on concrete. 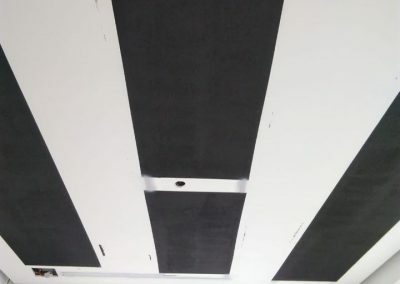 The heating paint has nearly unlimited durability, needs no maintenance no service or breakdown costs at all and will save you enormous amounts of energy.The energy efficiency makes this system extremely environmentally friendly. 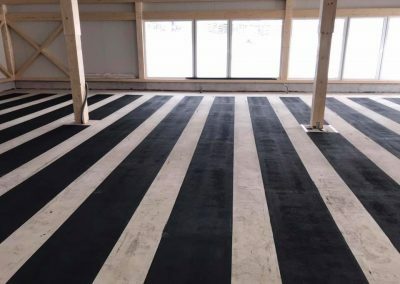 The energy introduced into the heating paint is converted directly into heat without producing line losses or CO2 emissions. A 10 year manufacturing guarantee is offered on the heat paint & 3 years on the control technology. 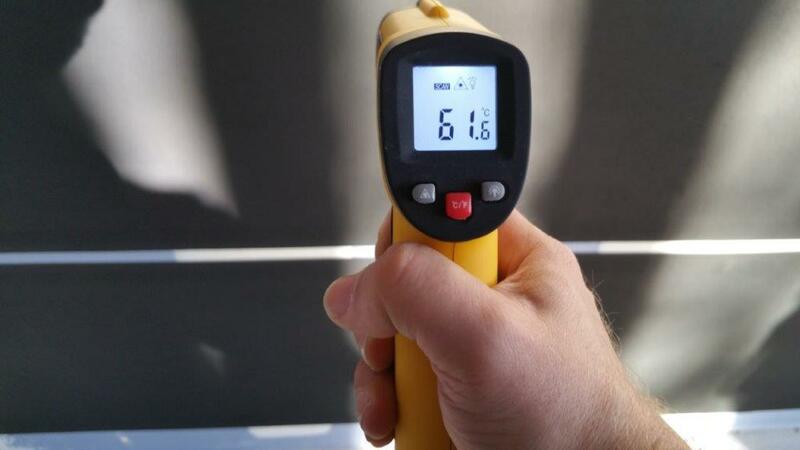 It is most efficient to locate the G2Temps heat paint in the coldest parts of a room. 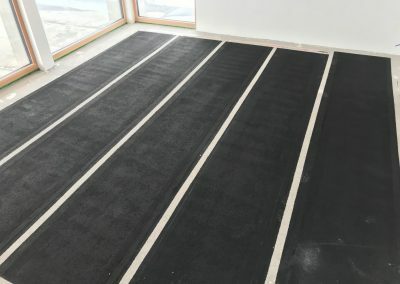 It should cover an area as big as possible to heat the room but does so very effectively, whilst using very low consumption. 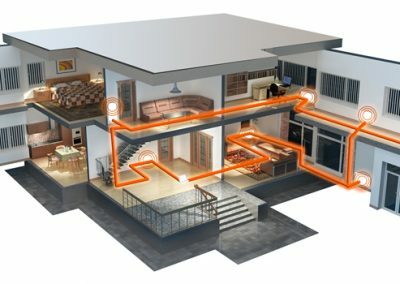 Less heat per m3 is needed to heat the room compared to other forms of heating including electric and gas convection systems. G2Temps is much more efficient than any other heating system. 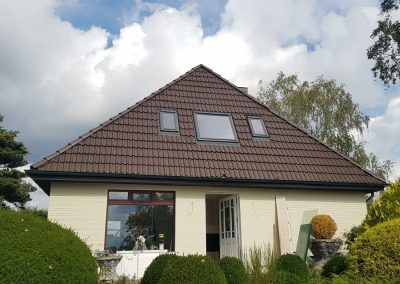 One of the reasons is that differences in temperature between the heating system and the outside walls are very small and therefore nearly no heat at all escapes outside. 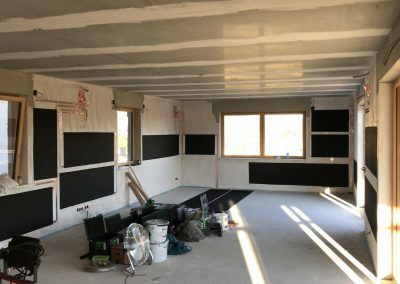 As the heat paint dries the walls, they become more effective insulation, a heat storage system whilst radiating enough heat into the room to keep the occupants warm. 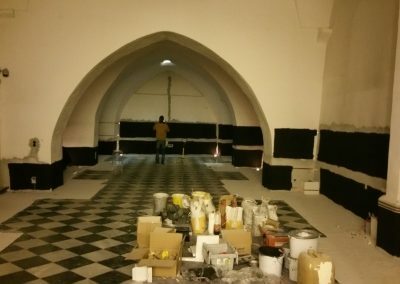 G2Temps is ideal for Church renovation heating projects and solves the problem of keeping congregations warm. 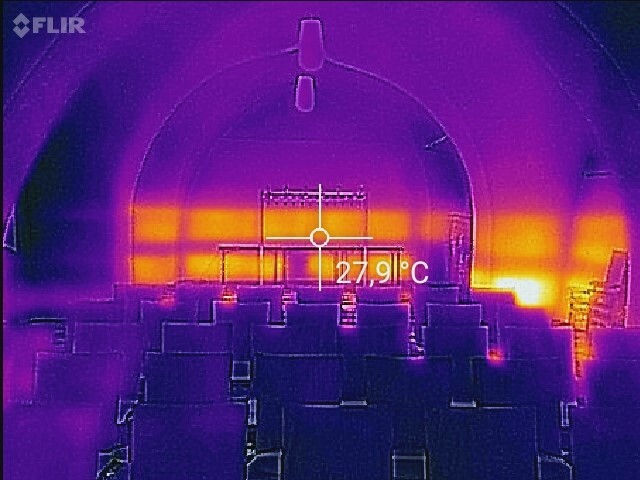 Thermal Proof Of Working G2Temps System At Church Project. Thermal Proof Of Working G2Temps Wall System At Church Project. Our G2Temps heating paint works similar to carbon fiber mats but our system is very different. G2Temps is in the safe light spectrum of 0.8 to 5.0 micrometres of electromagnetic waves (like radio and microwaves). The resistance of heat transfer depends on the thickness of the material. The current flow depends on the resistance and the voltage. 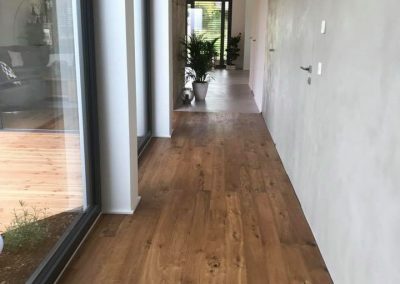 Therefore, the surface temperature depends on the current flow and the warmth in the room depends on the time the heater is used with the current flow. 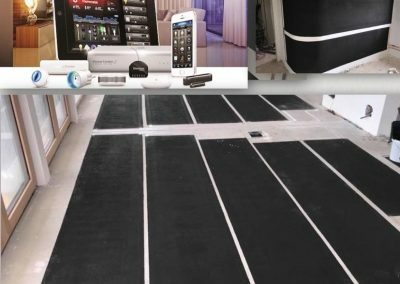 The efficiency of our heating can be easily calculated by multiplying current flow and voltage and the properties of the room. Efficiency multiplied with the activation time equals the energy which is equivalent to the warmth in the same unit. 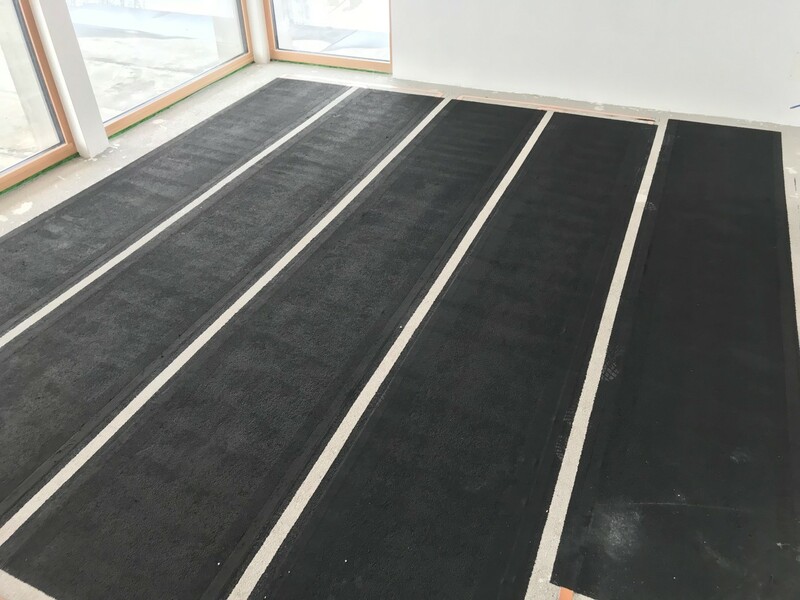 Carbon fibre mats (which are in effect, the equivalent to powder ‘soot’ or ‘needle fibre’) react with oxygen by deteriorating into the atmosphere and require high surface temperature and with that loss of the carbon, the heat reduces after time & hot spots arises. 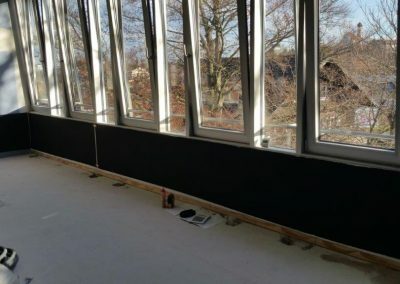 Some matts have rubber surfaces which cannot be installed in walls and are restricted to 220 watts only & 2.5 metres of length, are inflexible due to their heating power requirements, a limited life of around 7 years & reports of a loss of up to 80% on them have been recorded. The heating system paint is not subject to wear & maintenance free. It has a higher reactivity & flexibility and is generally powered to run at between 35 to 42 degrees C or higher dependent on requirements and insultation. 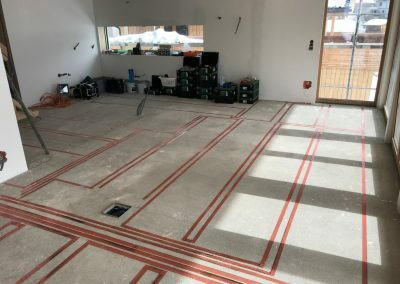 Our electrical tracks can be set out to 7 metres in length at 40 degrees C without loss of power. 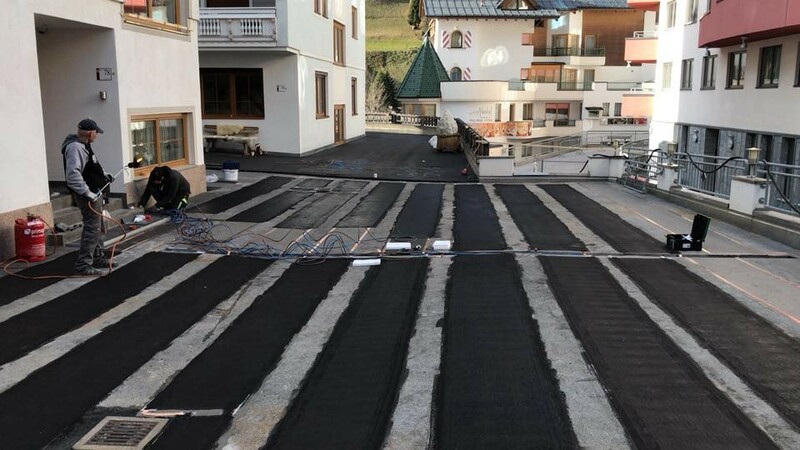 We are able to offer 15 metres tracking with higher cable cross section, tracks on edges, lines & corners are possible, 3 d textured surface tracks are possible and for special applications where requested we can produce systems of 100 degrees at 24 volts. NOW is the time for you to switch!!! Below are acknowledged scientific papers by experts in the field that demonstrate the effectiveness of infrared heating technology. 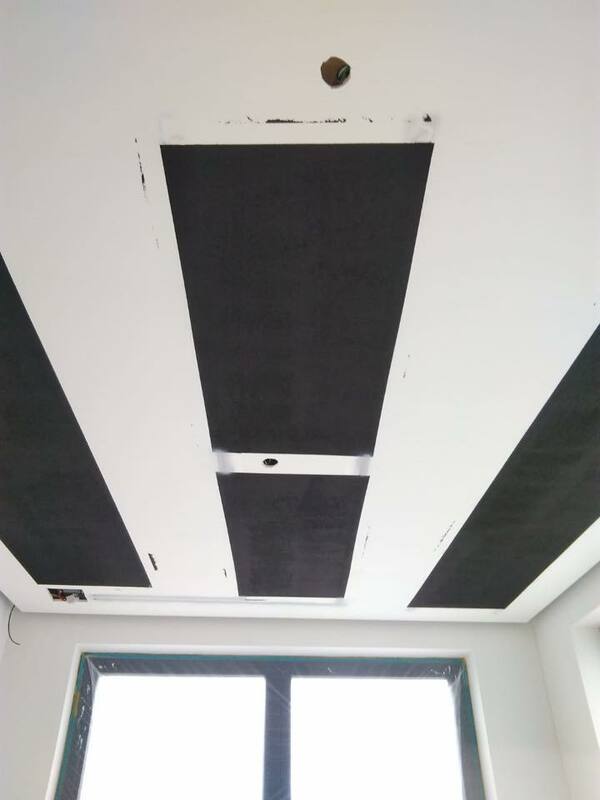 The reports findings feature positive confirmations of the benefits of infrared heating compared to gas and electric, convection and other forms of heating.